This is the second week of the Lunar New Year holiday, so there are still more tourists with guidebooks than usual around the city. 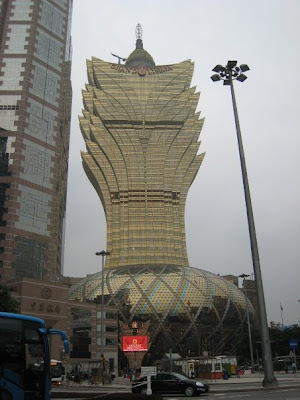 I spent a day in Macau, the former Portuguese colony known as the Las Vegas of Asia. It seems that just about everyone in Hong Kong decided to go to Macau this week. While I was waiting in the very crowded ferry terminal I saw a girl carrying The Sisterhood of the Traveling Pants. Back in HK I saw two people reading Chinese books, a man with a graphic novel that may or may not have been in English, and a group of women reading the Bible in Tagalog. I also saw another Kindle! It was the newest generation in that great slate gray color. I've now seen four Kindles besides mine after six months in HK. I love the idea of book spotting but I never seem to see any one reading, must look harder. I forgot to do some book spotting today. =P I hope I have something to report before your next post in this series. Hello I have received the Stylish Blogger award and am passing it on to your lovely blog! Thank you for the award! This is my first one and I am very excited. I'll be sending it on to more blogs soon. I love reading your blog, too! On bookspotting: I've found that I notice what people are reading even more now that I'm doing this post. It helps that I take public transportation all the time. The other day I almost followed someone off the train at the wrong stop because I was trying to see what book they were holding.